Lastly, don’t forget about our “Armor of God” GIVEAWAY that runs through 10/31. See details about the giveaway here. 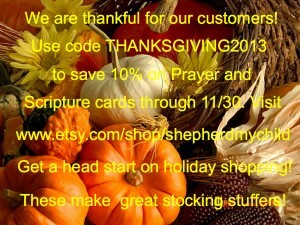 After 10/31, the “Armor of God” set will also be offered for purchase through our Etsy shop, and the code THANKSGIVING2013 can be used for this set too! Happy Shopping, and THANK YOU again for following our journey!